And if fate carries me back to the familiar place, I will come gladly and with hope. Tires singing on the weathered asphalt, wind whipping in my hair. I hope to search for the overgrown opening between the trees where a rutted road leads to an open field, and smell the scent of crushed grass in the fading light. With such pretty prose, Kat Rosenfield is definitely an author to watch. I would love to continue watching her evolve, and I hope she grows to become a five star-worthy Author. Unfortunately, Amelia Anne is Dead and Gone falls short of a five star-worthy read. After reading the introductory synopsis, I expected a mystery story with a compelling heroine. Instead, I was served a slow narrative of a girl hoping to escape from her town. Unfortunately for this girl, Rebecca, she is trapped in a small town and has to stay there for a summer. The story begins with Rebecca walking across her high school’s stage as a salutatorian with plans to attend the state college after summer. On the night of the graduation, Rebecca’s boyfriend breaks up with her in his car. On the following, morning the townspeople are informed about the murder of Amelia which coincidentally occurred at the location where s boy friend broke up with her. The story gives hints to Amelia’s life, her dreams to become an actress, and her relationship with her boyfriend Luke. I guessed the identity of Amelia’s killer at the start of the novel. My hunches proved correct; nothing surprised me. The book failed to be a mystery novel, leaving the story of Rebecca which I found Rebecca uninteresting. Her purpose, to get out of the small town and become a somebody, has been explored in better novels. The brief moments the book dwells on Amelia fascinated me because I found her likable compared to Rebecca. The prose bogged down the story. Yes, I admired it, but it dragged the plot down to a slow pace. Pages seemed to inch along like a slug ambling to the finish line. I feel that, in a different story, the prose would be appropriate, maybe in a story with more reflection. 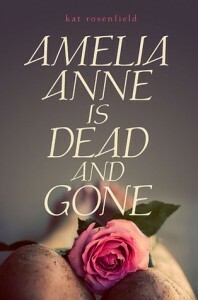 Amelia Anne is Dead and Gone was a decent novel, but failed to fully engage me. It just lacks the spark of a five star read. I give it three stars.